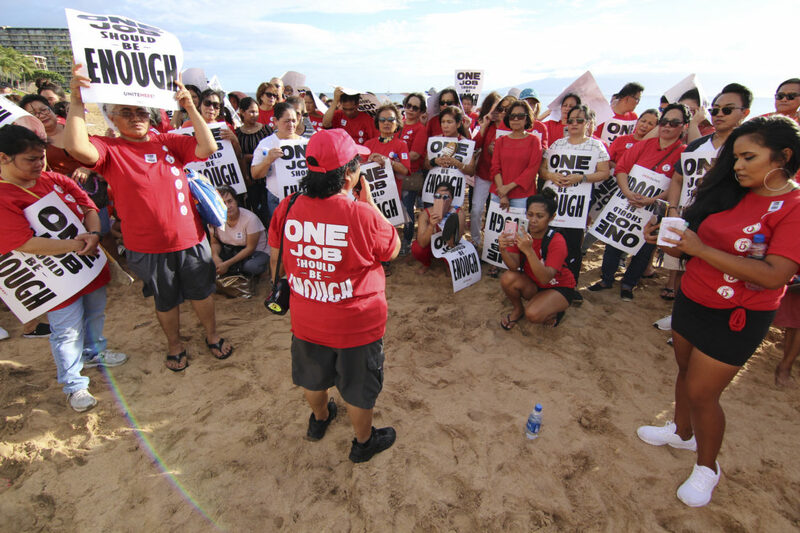 KAANAPALI — Under the rallying cry of “one job should be enough,” hotel union workers called for higher wages and a contract Monday afternoon on the beach fronting the Sheraton Maui Resort & Spa. 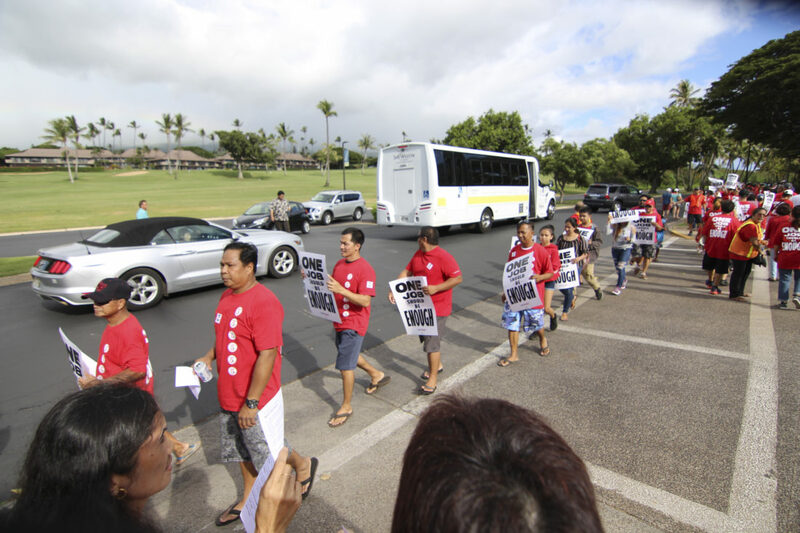 About 200 people, most of them Sheraton workers and members of the UNITE HERE Local 5 Hawaii union, marched in the Labor Day rally, which started at the entrance to the Sheraton before moving to Kaanapali Beach. Rodelas said the union is asking for pay raises but couldn’t disclose the amount. The union is also asking the hotel to do away with subcontracting. Rodelas said some hotels, including the Sheraton, hire outside cleaning companies, taking away housekeeping jobs. 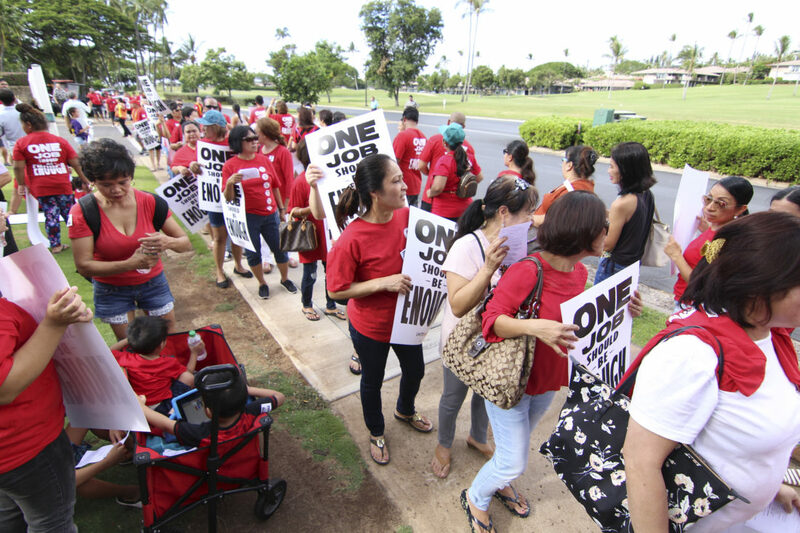 Other hotels, including some in Waikiki, hire companies to bring in prepackaged cut-and-prepared foods, taking away jobs from food-prep workers. Automation is also a major issue in the industry, Rodelas said. Rodelas said union members are not against new technology, but said the union wants to “get ahead of the issue” and make sure workers are taken care of as hotels automate more services. Erin Kelley, who’s been a bartender at the Sheraton for seven years, suggested that the hotel offer training in other departments for workers being replaced by new technology. She said waiting on a new contract has made her feel disrespected and nervous about her job. “We’re held to a really high standard, and we just want to hold Marriott to a high standard also and negotiate fairly,” Kelley said. Kelley, who lives in Honokowai, said she used to work multiple jobs in coffee shops, housekeeping and babysitting to make ends meet. Now, she just works as a bartender, but she said if she and her husband had kids, she’d likely have to find another source of income. Many of her co-workers hold down multiple jobs. Marilyn Fernandez is one of those employees who has to juggle jobs. She’s been a housekeeper at the Sheraton for 10 years and is a mother to three kids, ages 8, 9 and 10. 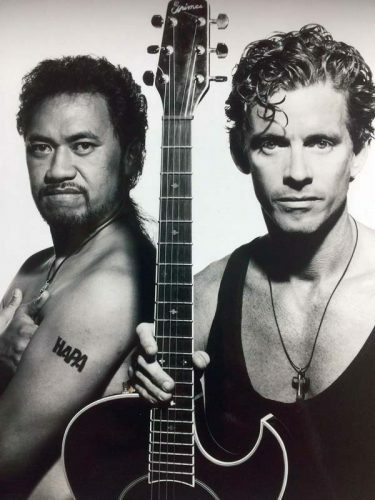 Until August 2017, she split her days between the Sheraton from 8 a.m. to 4 p.m., and the Hyatt Regency from 4:30 to 10:30 p.m. before making the 45-minute drive back to Central Maui. “It’s very hard for me because I have to come home, they sleeping already, and I cannot even help them with their homework,” Fernandez said. Fernandez said her kids’ grades went down until she quit her job at the Hyatt. Now she’s able to spend more time with them, and their grades have improved. However, on her off days she still has to drive a taxi at the Kahului Airport. Her boyfriend also works at the Marriott Ocean Club. Fernandez said she can see the disappointment in her kids’ faces when she tells them she has to be at work. “But I told them, ‘Why, you want to be a homeless if mommy not working?’ And they said, ‘OK, mom.’ It just really breaks my heart,” Fernandez said. Protests at Marriott properties also took place in seven cities around the country, including San Francisco, where 75 workers were arrested after blocking off a street around Union Square. The demonstration drew about 900 workers to the Marriott’s Westin St. Francis hotel. 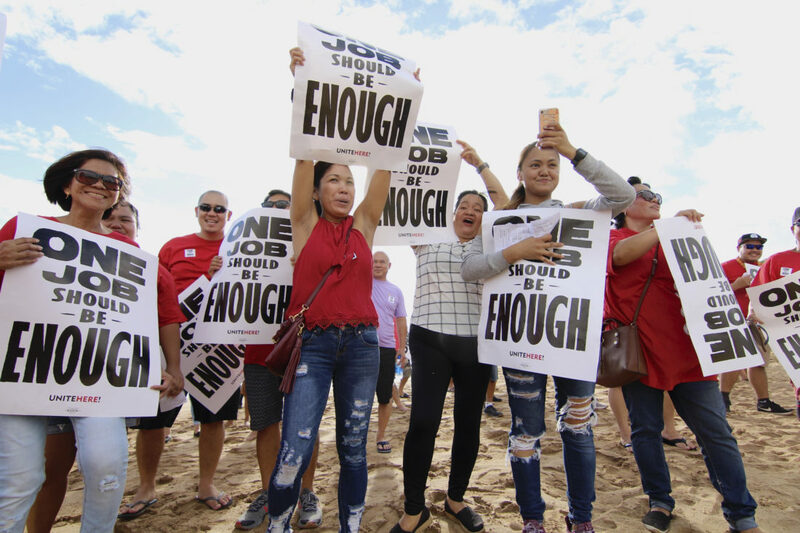 On Maui, Local 5 also represents workers at the Kaanapali Beach Club and Kaiser Permanente, as well HMS Host, which provides food and beverage services at the Kahului Airport and Gate Gourmet, which offers in-flight catering for airlines.